NSL Photography Blog: Does the perfect camera gear bag exist? Is it possible to design one? Does the perfect camera gear bag exist? Is it possible to design one? Permit me to remove the suspense before I even start. There's no such thing as a perfect camera gear bag. I've been in the midst of a discussion for a couple of months about the perfect camera gear bag. Many photographers have two, three, four, perhaps more camera gear bags. For this article I counted mine. I have seven camera gear bags, plus Pelican cases for shipping or hauling gear for various special shoots. The problem is, all bags have some strengths and weaknesses. Many bags are general purpose, while others are for specific uses. There are shoulder bags, belt bags, belt systems, sling bags, roller bags, and backpacks to haul photo gear. I use a backpack when in transit, a smaller backpack hiking, when shooting wildlife images, a Dryzone backpack by Lowepro for rain, snow, rainforests or rafting and a modular belt system by Think Tank in cities. I have other bags for other purposes. Each bag isn't quite suitable as a “perfect” multipurpose bag. Some are heavy, not protective enough in all conditions, a pain to carry all day, or scream “Steal me!” Some aren't large enough, for some shoots. With today's technology, in my opinion, it's not actually possible to design a “perfect camera gear bag.” If there were, camera stores wouldn't be carrying hundreds of camera bags from more than 60 manufacturers. I decided to have some fun designing the “perfect” camera gear bag. The only problem is, some of it's technology hasn't been perfected, or even invented yet, but I think you'll agree that if made, this would be the “perfect” camera gear bag. Maybe I should try to raise funds on KickStarter to research and manufacture it? I've named it the “Tardis Camera Bag.” You'll understand why momentarily. The Tardis bag has external dimensions of about 10" x 8" x 5" (25.4cm x 20.3cm x 12.7cm). It can be used as a sling, shoulder, belt or backpack bag according to the user's desire at any time. It will come in three colors: navy blue, royal blue and slate blue. While the bag is relatively small, like the Tardis transport, it has infinite room inside it. It has organizing partitions and heavy-duty padding to ensure no damage to the gear inside, even if hit by a bus, truck or spaceship. The Tardis bag is completely fireproof and will withstand an explosion up to a nuclear equivalent of 100MT. Inside the bag it has a fire and explosive suppression system in case of exploding batteries or other explosive or incendiary devices. 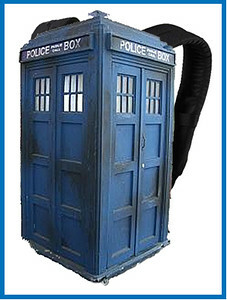 With it's built-in anti-gravity outer shell, the Tardis bag will weigh 2oz (57 grams), at all times, adjusted for local gravity, fully loaded, with any amount of gear inside it. That way it will hang nicely on any planet and be easy to carry. Of course, the bag would be fully waterproof, and protect its contents from temperature extremes by keeping the bag's internal temperature at a constant 68°F (20°C) and an internal relative humidity of no more than 10%. The Tardis bag is an anti-theft bag. Tuned to the owner's and designee's internal nervous system, it will utilize a stun wave, similar to that produced by a “Dinosaur stun gun,” to render all others unconscious (no permanent harm will come to those stunned) who attempt to touch, lift, or otherwise pilfer the bag. That will give the bag's owner time to call for the police and have the thief taken into custody. The bag's surveillance system videos can be uploaded to any police department computer system, to be used as evidence. The bag is voice controlled. (The voice sounds eerily like Jon Pertwee.) The owner sets the master control using a special code supplied by Dr. Who Inc. to imprint their voice. The bag owner can designate other users and imprint their voices on a temporary or permanent basis. The Tardis bag is continuously powered by the "Eye of Harmony," through a small internal antenna in the top of the bag, regardless of where the bag is located in the galaxy. At this time, the bag comes with a permanent, perpetual, royalty-free, license to draw whatever power is necessary to run it. If you lose the Tardis bag, never fear. It's equipped with a super-powered RFID tag and homing jet. Through your smartphone's Tardis bag app, available for iOS and Android, you can locate the bag anywhere in the galaxy and remotely order it to return to your position. It should take no more than 27 seconds to return to you from any point in the galaxy. At this time, the Tardis bag comes with a $5 US coupon to purchase the only "extra" available for it. For $10 US, $5 US with the coupon, you can add shield technology to the Tardis bag. It will shield you and the bag, while you are wearing it, or if within 20 feet (6 meters) of it, if you've temporarily set the bag down. The shield is an impervious bubble giving virtually total protection anywhere in the galaxy, even to Daleks. The shield provides a breathable atmosphere for human life while activated. At this time, the shield (version 1.0.8) can protect up to a family of four, plus grandparents and siblings, and ten friends or traveling companions, simultaneously. Frankly, at $19.63, plus 5 bucks for the shield, the bag's a steal!!! Does the price have to do with the number of Dalek's the Doctor has subdued? Ned, does it somehow have to do with the number of Doctors over the years? Is it somehow the number of years the show has been on is some math formula? Is it the number of episodes so far? Hi Everyone. No one's got it yet, but I assure you there's an answer and it's a legitimate number based on the show. I don't know about your question Ned. I've only found the Dr. Who show this season. If you end up making the bag please reserve at least two of them for me. I'd pay 10x for a bag like that. It has everything. I love the beautiful touch with the smart phone app. Great article. I kept laughing throughout. Ned, is it the number of episodes of Dr. Who to date? No one has it so far folks. Keep trying. It's not obscure and the number comes from a real source. Ok, I'm thinking it's the total cost of the program in the millions. I love the program which I watch on British TV from Madrid. That's not it Vic. I'm guessing you're not originally from Madrid with your name? You're right Ned. I'm from Manchester and still have my season tix for Old Trafford. I'm stationed here for my company. Madrid is a great place to live, but I do miss home. I'll be here for about 5 more years. At least I go home for about half our home games. I go to Real Madrid games here. Okay, how about it's the number of actors...not that can't be. I give up for now. Vic, you still don't have the answer. Manchester United is my favorite team outside the US. I even have an MU jersey one of the kids I coached got for me when he saw a game at Old Trafford. I've played and coached soccer. I recently retired as a USSF Referee. I agree that Madrid is a great place to visit or live. I don't like its airport very much, however. Too much walking to get anywhere and too many gate changes. Our gate for our flight home from a recent trip there changed 5 times before settling down. Ned, is it the number of episodes show, plus the ones accidentally destroyed by the studio? Still no correct answers. Keep trying. I've got it. It's the total number of actors who've had parts in the program. Sorry Harriet, that's a great guess, but it's not the answer. Love the article Ned. It's lots of fun. I'm a big Dr. Who fan, but I have no idea how the "time lords" set the price. Thanks for the laughs this morning. I'm still laughing, especially at the stun wave. I'm a police officer. I wish I had one of those. I'm not going to guess the answer to your question as I have no idea. You have a flair for this. Write some more fun articles to go with the serious ones. I'm still laughing about the bag design. Thanks for that. Ned, why no Windows app for the Tardis bag? What a neat article. Too many photographers are totally serious and never crack a smile, especially to laugh at themselves when they've done something humorous. Ned, where do I place my order for 10? I want to give them to friends and family. Is 1,963 the number of Daleks left roaming the galaxy? Sorry Tim. That's not the answer. Can I get the Dinosaur stun gun when I order the bag? I know it will cost extra. You all are as bad as me (LOL). No, sorry, we're just licensing the use of the Dinosaur stun gun patent to make our anti-theft shield. We're not producing the gun. Ned, I do know the answer. 1963 is the first year Dr. Who aired on TV. Thanks to all for your readership and your comments. They're appreciated. Kimberly, that's the answer. For being the first to answer the question, you get a free Tardis bag with optional shield technology when we produce it, perhaps in the 23rd century or so. Thanks for answering the question. JL, you got the answer right too. You'll get a free Tardis bag with optional shield technology too. I think we should have it ready by Feb. 2219. JL you actually got the answer first, but it got stuck in the moderation area after Kimberly. Sorry for the mix-up. Love the fire and explosive suppression system in case someone slips a Samsung Galaxy Note 7 into my Tardis camera bag! How often do we get to read a photography article that's nothing but fun. Thanks Ned. I'm still laughing.